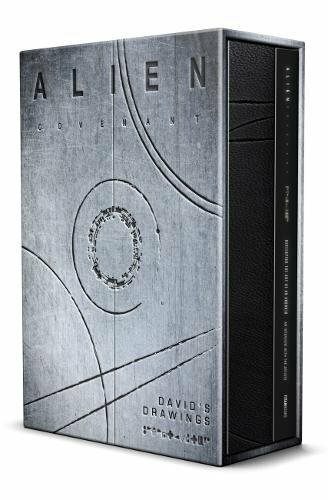 This is a wonderful and disturbing (in a good way) companion artbook for Alien: Covenant. There are actually two books in this slipcase set. The much thinner paperback collects the interviews with concept artists Dane Hallett and Matt Hatton. They talk about the art direction, Ridley Scott, the art and how to make this film look and feel new without copying too much from H.R. Giger. There are many accompanying artworks and photos. The photos of the lab set with all the props, the sculptures of the creatures, aliens are fantastic. That lab is like a lab set in a cavern. Looks so cool. The thicker book features the drawings from David. Through the drawings, you can find out what David has been up to all those years he was stranded on the Engineers' planet. There are over two hundred drawings of flora, fauna, the creatures he hope to create. The artworks are of macabre and grotesque, truly scary. David is like some mad scientist or doctor, someone who doesn't care about code, conduct or decency when it comes to his experiments. This book reminds me of those technical or scientific books on botany or animal art, well, except all the drawings in here are of things more sinister. There isn't a lot of text except for the occasional notes by David. This is sort of like a downside because wow, imagine what goes on in David's mind when he's coming up with these creations. What was he thinking? Overall, this is a fantastic artbook. When the book first came out, it was priced around US $48 and you could get it directly from Amazon. But now the price has went up to US $100 and more and sold by third party sellers.